To read this newsletter in an easy-to-read .pdf form, click here to download the file: May 2011 Newsletter. Thank you. Carbohydrates, in refined form, can lead to blood sugar issues. Yet, “traditional”1 carbohydrates—whole and minimally-processed grains as well as legumes, fruits, and vegetables—help prevent insulin resistance and chronic disease.2 Therefore, to control blood sugar, the answer is not to eliminate carbohydrates. Instead, we need to emphasize traditional carbohydrates, while also using proteins and fats, with their flat-to-negative glycemic impact, to buffer the glycemic effect of the refined carbohydrates that we do choose to eat. Carbohydrates are the essential dietary mainstay of all population groups. Today, they account for between 40%-80% of the calories consumed by people around the globe. Carbohydrates are the cleanest burning of the three macronutrients—proteins, carbohydrates, and fats—and the primary fuel of the brain. Carbohydrates perk us up and make us feel good. We like carbohydrates because our taste buds are primed to “sweet.” And, we buy and consume refined carbohydrates in abundance because they are inexpensive and readily available, have a long shelf-life, and require little if any refrigeration. Refined carbohydrates are everywhere and go anywhere. The glycemic index (GI) developed by Dr. David Ludwig or the University of Toronto is the classic way to gauge the blood sugar impact of carbohydrates. In recent years, particularly through the efforts of the University of Sydney, the concept of the glycemic index, a measure of the quality of carbohydrates has been expanded to include a quantity refinement termed glycemic load (GL). The University of Sydney’s website www.glycemicindex.com provides information about carbohydrate foods and blood sugar, including GI and GL listings for hundreds of foods that have been tested in the rigor of the science lab. Measures such as GI and GL can be used to select foods to balance blood sugar. For example, coupling a low-GI food with one that is high on the GI scale creates a meal with a GI that strikes a balance between the two. In these modern times, with the plethora of blood-sugar-related diseases, we need tools like GI and GL to help us understand ways to control blood sugar. I believe that there are two major reasons why blood-sugar chronic diseases are so prevalent today: The shift in the American diet from fats to carbohydrates and from traditional to refined carbohydrates. The Shift From Traditional to Refined Carbohydrates. The second factor—the postwar shift from traditional to refined carbohydrates—is largely due to the growing role of the commercial food industry and processed, convenience foods. Convenience foods must have a long shelf-life, so food companies rely upon refined flours and oils, which do not go rancid. Data from the Economic Research Service of the USDA indicate that of the carbohydrates Americans do consume, most are derived from grains (rather than from fruits and vegetables). Of these grain-based carbohydrates, 90% are in the form of high-glycemic cereals and bakery products that spike blood sugar to foster inflammation and chronic disease (such as insulin resistance and coronary heart disease). Only a small proportion—about one in every nine calories—is derived from slower-metabolizing whole-kernel grain products for a more moderate blood glucose effect. In this newsletter, a sequel to April, I want to first consider some measurement limitations and variations associated with trying to gauge the true blood glucose impact of various foods. Not to be critical of the glycemic index, the goal is rather to support the notion that self-testing is perhaps one of the very best ways to discover how our own bodies react to favorite foods, eaten at the times of day when we consume our meals and snacks, and against the backdrop of our own personal lifestyle, including our level of activity. We do not live under scientific lab conditions, nor do we consume most of our food as the first morning meal following a 12-hour fast. As discussed below, many factors, such as the amount of cooking, can affect the GI “score” of a food. The self-testing, graphic approach to food testing developed in the balance of the newsletter is a less scientific but a more dynamic way to explore postprandial (post-meal) blood glucose levels (BGLs). Visual pictures of postprandial blood sugar behavior, while less scientific than GI measurements, are nevertheless powerful learning tools, providing a real flavor for how our body reacts when we eat different kinds of foods. GI measures the blood glucose impact of foods eaten in isolation, yet we rarely consume foods this way. GI readings for the same food can vary widely depending upon whether a food is measured in relation to white bread (higher numbers) or glucose (lower readings). Looking at some breakfast foods illustrates the variation in GI, where either white bread or glucose is the measurement standard—for example, a bagel (GI=103; 72), corn flakes (GI= 116, 81), and a piece of whole-grain toast (GI=58, 41). Glucose is the typical standard, although white bread is thought to be more reliable. If you read a GI in isolation, know which standard is being used. The GI of any food will vary with the temperature of the food and amount of cooking (warmer and well-cooked is higher than cold and raw); the degree of ripeness (ripe scores higher than “green”); and particle size (a whole, raw carrot’s GI=16 will be lower than a diced raw carrot, GI=35, or one that is diced and cooked, GI=49). GI readings vary with the individual—blood sugar and insulin reactions are more extreme for diabetics, for example (See Charts 2A and 2B). GIs are calculated in the science lab as the day’s first meal after a 12-hour fast and using a fixed serving that includes 50 grams of carbohydrate. Most of our daily calories, however, are consumed in combination and throughout the day, when our blood sugar is affected by other foods that we have eaten earlier, as well as by our level of activity. In addition, we rarely consume foods in 50-gram carbohydrate portions [that is a lot of oatmeal!]. As a final factor, and my major point for constructing graphics and writing this newsletter, is that GI is a static number that cannot convey what happens in our body when we consume a meal. 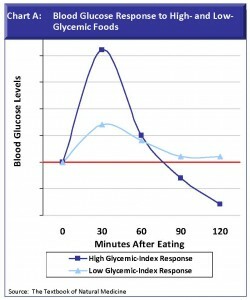 GI cannot provide a visual picture of blood sugar behavior—its shape and trajectory—during the time following a meal (for an example, see Chart A). I believe pictures are the best tool for learning how to combine foods effectively to control blood sugar. A single number cannot touch us and teach us in quite the same way. To control blood sugar, what we are after—the real goal—is to avoid “metabolic stress” that puts our hormone system on “red alert” and our body through a hyper/hypoglycemic rollercoaster. Metabolic stress occurs when we eat too much high-glycemic food and/or too much carbohydrate without sufficient protein/fat “buffers.” The result is a sharp rise in blood glucose (Chart A), forcing insulin, the glucose storage hormone, to come to the rescue, and remove excess glucose from the blood stream. Instead, we want to choose low-glycemic foods and higher-GI carbohydrates balanced by proteins and fats (their GIs=0) so that blood sugar rises moderately and is sustained for several hours above the pre-prandial (pre-meal) zero line (Chart A). Such a low-glycemic pattern is what helps maintain energy and mental focus. In contrast, high-glycemic foods eaten alone or in combination create a blood sugar spike that can result in hunger, irritability, lack of concentration, and overeating shortly after a meal. [See the work of David S. Ludwig, High Glycemic Index Foods, Overeating, and Obesity, www.pediatrics.org]. Metabolic Stress. As touched on above, metabolic stress describes what happens in the body in reaction to excessive levels of blood sugar following a high-glycemic meal. In an attempt to restore blood sugar to normal levels, the pancreas releases insulin to remove excess glucose. With the help of insulin, much of this glucose is stored in the form of glycogen in the liver, in the blood as high triglycerides, and as fat in the cells of muscles and tissues, particularly around the belly. Unfortunately, in the “alarm mode” it is easy for the pancreas to overshoot. 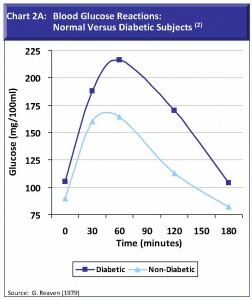 Insulin in excess can then cause a steep drop in blood sugar (BGLs plunging below the zero line, as shown in Chart A) and a hypoglycemic condition that can trigger a new cycle of hunger, irritability, cravings for carbohydrates, and overeating. When insulin does its job too well and blood sugar dips to hypoglycemic levels that are inadequate to fuel the brain, the body calls upon a new set of hormones—principally glucagon, as well as adrenal hormones such as cortisol and adrenaline—to restore blood sugar to normal levels by reversing the fat-storage process. Glucagon does this by setting in motion enzymes needed to convert the liver’s glycogen stores back to glucose. Of the following numbered charts, the first three are based upon scientific research journal articles (Charts 1, 2A, 2B), while the last four (Charts 3-6) are constructed from my own self-testing of foods4 using a simple blood glucose monitor. I decided to do my own testing for two reasons—I wanted to try a variety of foods and combinations that, to my knowledge, have not been tested and presented graphically in scientific journals; and, I wanted to illustrate how easy this can be as a way to encourage you to try testing your own favorite foods. From graphic drawings of what happens to blood sugar after eating different foods, we can discover strategies for “food combining” that will moderate blood sugar—combining fats and proteins with high-glycemic foods (to offset their blood glucose impact), while emphasizing combinations of lower-glycemic whole grains, legumes, fruits, and vegetables to avoid metabolic stress. It is interesting to note that, apart from vigorous exercise, only proteins and fats, with their flat-to-negative impact on blood sugar, can effectively temper high-glycemic carbohydrates. While fruits and vegetables are laudable in so many ways, their own carbohydrate content adds to the glycemic load of a refined carbohydrate meal. Thus, fruits and vegetables cannot be counted on in the same way that proteins and fats can to effectively dampen the metabolic impact of refined carbohydrates. 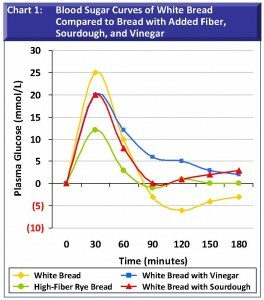 Chart 1: Blood Sugar Curves of White Bread Compared to Bread with Added Fiber, Sourdough, and Vinegar. Eating white flour products like white bread readily exposes starch granules to digestive enzymes. Starch is quickly digested and absorbed, and glucose is rapidly delivered to the blood stream. The resulting spike in blood sugar at 30-minutes is followed by a hypoglycemic “low” within 90 minutes of eating. In other words, within 90 minutes, hunger can set in. As the work of insulin removes excess glucose from the blood following the 30-minute peak (Chart 1), and, without other foods to slow digestion and delay gastric emptying (like proteins, fats, and fiber), blood sugar plummets to below pre-meal levels soon afterward—we are hungrier than before! Acids like sourdough and vinegar slow digestion and moderate this pattern. Of the variations shown, fiber added to foods is the most effective at moderating postprandial blood sugar. Chart 3: Instant Oatmeal, Whole Oats (Soaked and Not Soaked), and Whole Oats Combined with a Protein and Fat. 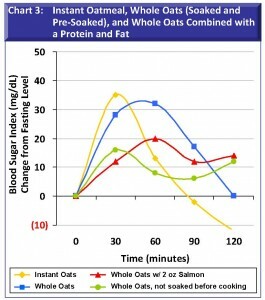 Instant oatmeal, which we might think to be a wholesome breakfast, in fact traces a blood glucose pattern similar to white bread (shown in Chart 1). This may be indicative of the fine particle size to which oats must be ground to become “instant” and to the oat flour that is often added to instant oatmeal as a thickening agent. In two separate tests, I also consumed instant oatmeal adding 1 tablespoon of sugar, which resulted in a higher 30-minute peak; and, instant oatmeal adding 1 tablespoon of butter, which reduced the peak at 30 minutes and sustained the curve above zero through the 2-hour test period (I did not clutter the chart to show these expected results). Chart 3 also illustrates that soaking whole oats (to degrade phytic acid, a mineral inhibitor) greatly increases the glycemic impact compared to oats that are not pre-soaked before cooking. This is because soaking makes grains more digestible and renders the starch more available to digestive enzymes. Adding a protein/fat to pre-soaked, cooked whole oats—in this case 2 ounces of salmon—significantly dampens the metabolic reaction and easily sustains blood sugar throughout the two hours following the meal. 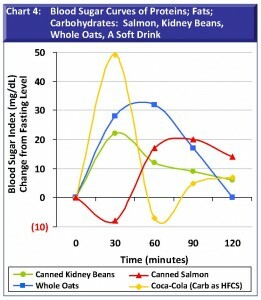 Chart 4: Blood Sugar Curves of Proteins; Fats; Carbohydrates: Salmon, Kidney Beans, Whole Oats, and a Coke. This is one of my favorite charts because it illustrates disparate blood sugar reactions to quite different foods—a protein/fat (salmon); a whole-grain carbohydrate (oats); a carbohydrate/protein (beans); and a pure high-fructose corn syrup (HFCS) carbohydrate (Coca-Cola). The footprint of the Coke is a classic case of metabolic stress: the peak glucose increment of 50 at 30 minutes is by far the greatest reaction of any food I tested as a first meal. With the Coke, insulin comes to the rescue to such an extreme that blood sugar plummets to pre-fasting levels within the first hour following the Coke. What the chart says is, if we have a Coke for a breakfast on the run, we can be hungry by the time we arrive at school or the office —and, all the while we have also put our body’s hormone system through the wringer. As an extreme contrast to Coke, salmon drops initially in the first 30 minutes (the flat-to-negative glycemic effect of proteins and fats) and then rises above pre-meal levels. In the case of both slow-metabolizing proteins and fats, the body has time to moderate the flow of insulin and glucose to keep blood sugar well-balanced. Because the body reacts to proteins and fats in mirror-image fashion to carbohydrates (contrast salmon with oats), proteins and fats can be paired with carbohydrates to modulate the 30-60 minute blood sugar rise normally associated with carbohydrates (as in the Coke and whole oat curve) and cushion the 60-120 minute drop in blood sugar that would otherwise occur with these carbohydrates. In other words, in view of the salmon curve, it seems to make sense to begin meals with sufficient proteins and fats before introducing high-glycemic foods. Our final example here is kidney beans, which illustrates the value of foods that are balanced combinations of carbohydrates, fiber, and protein (see the food composition list in Appendix A, which outlines the macronutrients of our test foods.). Kidney beans can be eaten alone due to the inherent blend of fiber, protein, and phytic acid (phytates reduce the glycemic effect). After a meal of kidney beans, blood sugar traces a moderate initial rise and a gentle tapering off, but at levels that are sustained above pre-prandial levels throughout the 2-hour test period. Chart 5: Kidney Beans with Added Grains; Vinegar; and Vinegar and Oil. Because kidney beans trace a gentle, sustained blood sugar curve, I chose to use them to test the addition of an acid (apple cider vinegar); an acid and oil (vinegar and extra virgin olive oil); and a carbohydrate (whole oats that were pre-soaked before cooking). 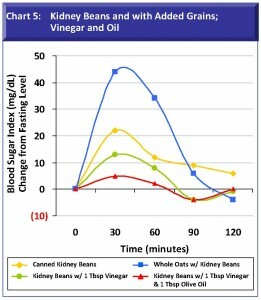 Adding vinegar to beans and even more so, vinegar and oil, significantly moderates the blood sugar effect of kidney beans. Vinegar and oil accomplishes this same function for other foods if you keep them handy at a central place in the kitchen and on your dinner table. Combining beans with grains (in our bean-whole oats example) would normally call for a 1:2 ratio of beans-to-grains in order to assemble complementary amino acids in the right proportion for a complete vegetarian protein. Yet, eating beans and grains in this standard vegetarian way spikes blood sugar. The idea that “wholesome” vegetarian meals push blood glucose to an uncomfortable zone is also borne out by other examples of vegetarian meals explored in my own day-to-day personal testing. It appears that vegetarian meals, without the anchor of animal proteins and fats, easily spike blood sugar. [Vegans and vegetarians may be particularly interested in using a simple blood glucose monitor to sharpen food combining skills.] What I believe this specific beans/oats case tells us is that beans and grains alone can deliver too much carbohydrate for the body to handle, if not offset with adequate protein/fat buffers. The second meal effect means that what we eat at one meal affects the glycemic and insulin response at the next. A low-glycemic breakfast will curb the response at lunch, and a low-glycemic dinner can have the same muting effect at breakfast the next morning.5 A breakfast of pancakes with maple syrup will work best when preceded by a late steak dinner the evening before. 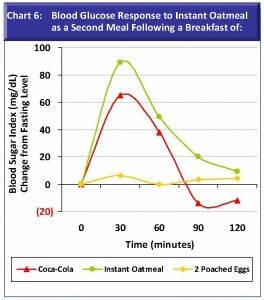 Chart 6: Blood Glucose Response to Instant Oatmeal as a Second Meal. This chart illustrates the second meal effect– that what we eat at one meal affects postprandial blood sugar behavior at the next. Procedure: On three separate mornings I ate instant oatmeal as a second breakfast three hours after a first 12-hour fasting breakfast. On each of three separate mornings, the first meal was either—two poached eggs; instant oatmeal; or a Coca-Cola. To fully appreciate the impact of two back-to-back carbohydrate breakfasts please notice that the scale used for Chart 6 is twice that of Charts 3-5. Results: Eating two successive carbohydrate breakfasts dramatically spiked blood sugar at the second meal. This was true for Coke-oatmeal, but especially oatmeal-oatmeal. In dramatic contrast, 2 poached eggs as a first breakfast comfortably accommodated the carbohydrate load of oatmeal as a second meal—this curve meanders around the zero line. There was no rise in blood sugar following the second meal of oatmeal—a food that normally spikes blood sugar. This second meal experiment points to the wisdom of eating dessert at the end of a meal—when ,like 2 eggs, proteins and fats from a typical dinner can buffer the sugar in a sweet dessert. More importantly in terms of successive meals, it, of course, suggests the importance of a good breakfast that includes proteins and fats, not only to help get through the morning without hunger, but also to blunt the blood sugar effects of the 10 o’clock coffee/snack break. If nothing else, it means we need to feed children a wholesome breakfast that includes proteins and fats to stay with them through the morning and to curb the blood sugar impact of snacks—such as graham crackers and apple juice that are so often served at nursery schools. What we do to our children when we give them a sugary cereal or a Pop-tart for breakfast extends beyond this first meal to affect their blood sugar, hunger, concentration, and desire to overeat throughout the rest of the day. For a more complete discussion, I again recommend the work of Dr. David Ludwig regarding high-glycemic foods and overeating, cited in the Recommended Reading section at the conclusion of this newsletter. Blood glucose monitors are sold in most drug stores, where they are principally inventoried to serve diabetics. They are not expensive. A simple monitor sells for around $30. The sophisticated replacement test strips that are used to take each reading (expressed as mg/dL) are what can be expensive (though strips can be covered by insurance). Refills usually cost more than $60 for a set of 100. A monitor is quite easy to use. Most pharmacies can help you if you are having trouble. 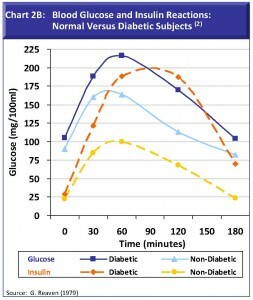 Resetting the Table–to Control Blood Sugar (For a discussion of other strategies, see April 2011). Ramekins filled with condiments like nuts and seeds (GI=0). Nuts and seeds provide healthy fats, fiber, vitamins, minerals, and antioxidants, while they slow digestion and curb blood sugar. Sourdough bread or whole-grain bread with whole kernels; butter from grass-fed cows and organic nut and seed butters such as tahini and pumpkin seed butter. A pitcher of water and glasses for all—sometimes we mistake hunger for what is in fact thirst. You might flavor the water with a little lemon juice or other flavoring. Coconut sugar to replace cane sugar. Coconut sugar is not refined so it retains minerals, including magnesium, zinc, and iron, as well as B vitamins. Its GI about half that of cane sugar. Powdered cinnamon. One of the best herbs and spices to moderate blood sugar. It can be sprinkled on hot cereals and desserts such as puddings, custards, and stewed fruits. If you currently take a chromium supplement to curb blood sugar, consider brewer’s yeast, if you do fine with yeast—yeast is a common allergen. [Brewer’s yeast is a different variety from torula yeast, the yeast linked to Candida]. Brewer’s yeast is loaded with B vitamins and minerals. One tablespoon provides 70% of the RDA for chromium,8 the primary micro-mineral required by the body to regulate blood sugar. Brewer’s yeast can be sprinkled on salads, soups, yogurt, or mixed in drinks. It is high in phosphorus (40% RDA), so be sure to consume sufficient calcium, and do not overuse. Side Question: How can people in some LDCs consume an 80% high-carbohydrate/high-glycemic diet and avoid diabetes? My guess is there are at least three reasons—more chromium in the soil; fewer refined carbohydrates (refining removes 90% of the chromium in wheat, as well as the fiber); and vigorous physical activity. High-glycemic foods are not “ bad;” they are appropriate to restore the body from rigorous physical labor. Dressing: Equal parts—shoyu or tamari; tahini, and mirin. Once quinoa is cool, mix with carrots, celery, scallions, almonds and toss. For the dressing, mix and whisk together equal parts, shoyu, mirin, and tahini. Add dressing to quinoa salad, toss and enjoy. For my own self-testing of foods, I used a simple blood glucose monitor. I appreciate that to hold scientific weight my tests would require a large sample size and multiple rounds of testing, but this was not my intent. Instead, I wanted simply to provide a rough feeling for how foods affect blood sugar following a meal. I did apply a degree of rigor, by testing foods as the first meal of the day consumed after a 12-hour overnight fast, and I consumed comparable quantities of food, where applicable. In selecting foods for testing, I wanted to try foods that were rather pure proteins, fats, carbohydrates, as well as combinations thereof. In reality, few foods are totally protein, carbohydrate, or fat. Even though we think of whole oats as a carbohydrate, they are also fiber, protein, and 3 fat. So, to interpret the charts, I list here the composition of the foods in my test universe. Eggs, 2 poached=12 g protein, 8 g fat, 0 g carbohydrate. Because 12-hour fasting, pre-meal blood sugar reading can vary, all data points at time zero prior to the first morning meal were indexed to zero in order to illustrate the change from a neutral starting point. Granfeldt, Y., Liljeberg, H, Drews, A., Newmand, R, & Bjorck, I. (1994). Glucose and insulin responses to barley products: influence of food structure and amylase-amylopectin ratio. American Journal of Nutrition, 59, 1075-1082. Jenkins, D.A., Wolever, T.M., Taylor, R.H., Griffiths, C., Krzeminska, K., & Lawrie, J. A. (1982). Slow release dietary carbohydrate improves second meal tolerance. American Journal of Clinical Nutrition, 35, 1339-1346. Juntunen, K.S., Niskanen, L.D., Liukkonen, K.H., Poutanen, K.S., Holst, J.J., & Hykkanen,H.M., (2002). Postprandial glucose, insulin, and incretin responses to grain products in healthy subjects. American Journal of Clinical Nutrition, 75 (2), 254-262. Ludwig, D.S, Majzoub, J.A., Al-Zahrani, A., Dallal, G.E,, Blanco, I, & Roberts, S.B. High-glycemic index foods, overeating, and obesity (1999). Pediatrics, 102 (3), e26. Retrieved November 6, 2010 from: http://pediatrics.aappublications.org/cgi/content/full/103/3/e26. Ostman, E. (2003) Fermentation as a means of optimizing the glycaemic index: food mechanisms and metabolic merits with emphasis on lactic acid in cereal products. Department of Applied Nutrition and Food chemistry, Lund University, Sweden, 1-59. Ostman, E.M., Nilsson, M., Liljeberg Elmstahlt, H.G.M, Molin, G. & Bjorck, I.M.E. (2002). On the effect of lactic acid on blood glucose and insulin responses to cereal products: mechanistic studies in healthy subjects and in vitro. Journal of Cereal Science, 36, 339-346. Reaven, G. (1979). Effects of differences in amount and kind of dietary carbohydrate on plasma glucose and insulin responses in man. The American Journal of Clinical Nutrition, 32, 2568-2578. Wolever, T.M.Jenkins, D. A., Ocana, A.M., Rao, V.A., & Collier, G. R., (1988). Second meal effect: low-glycemic-index foods eaten at dinner improve subsequent breakfast glycemic response. American Journal of Clinical Nutrition, 48, 1041-1047. Gropper, Smith, and Groff, Advanced Nutrition and Human Metabolism. Institute for Functional Medicine, Clinical Nutrition: A Functional Approach. Pizzorno and Murray, Textbook of Natural Medicine.